Used Cars Buying used: Should we go with the Honda Accord or Toyota Camry? Should we go with the Honda Accord or Toyota Camry? Dad jokes and dad bods are trendy, so why not dad cars? Well, facing growing competition from sportier rivals and compact SUVs, Toyota has been trying to ditch the image of the Camry as dad's car. First, it gave the Camry a snazzy (for a Camry) facelift in 2015. Then it gave us an all-new 2018 Camry, designed for, well, not your parents. 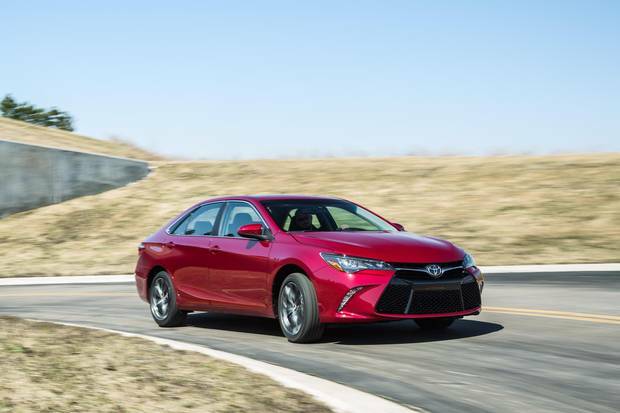 The 2015 Camry, while still relatively staid, had room and reliability. But it still wasn't as fun to drive as rivals. The Accord from the same year was peppier and handled better. There are other solid options, including the 2015 Ford Fusion ($16,122), 2015 Hyundai Sonata ($16,518), 2015 Nissan Altima ($17,231) and 2015 Mazda 6 ($17,500). Consumer Reports recommended both the 2015 Camry and the 2015 Accord. Both scored five out of five for reliability. The 2015 Toyota Camry has a roomy interior, but isn’t as engaging to drive as its rivals. This is still your father's Camry. But, after a serious facelift, it's sexier and sportier – relatively speaking. "If anything, its previously so-so interior quality and forgettable driving experience made it stand out from top-rated family sedans like the Ford Fusion, Honda Accord, Mazda 6 and Nissan Altima in a negative way," said review site Edmunds. "The 2015 Toyota Camry, however, corrects many of its previous deficiencies, adds a little more verve and, although we wouldn't go so far as to proclaim it the class leader, places it squarely within the best-in-class pack." There are four trims (LE, SE, XSE, XLE) on the gas car and three (LE, SE and XLE) on the Hybrid. A back-up camera was standard on the base LE (original MSRP: $23,850). Edmunds liked the comfortable and roomy interior, better-than-average rear seat space, decent visibility and user-friendly interior controls. Its biggest gripe? The Camry's rivals are just as comfortable – yet more engaging to drive. Consumer Reports said "suspension changes improved ride and handling, but only slightly." There was one recall to replace a power steering control unit that could fail, cutting power steering on the road. The 2015 Honda Accord’s responsive handling and quick acceleration make it surprisingly fun to drive. 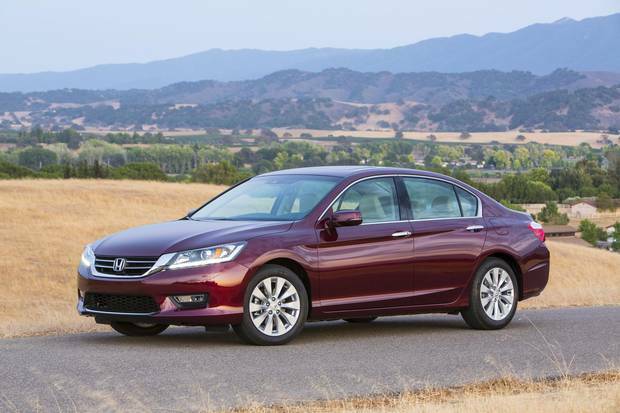 You can't call it edgy, but the Honda Accord is a little sportier than the cushier Camry. "Highway driving is where the Accord shines, with surprising power from its 185-horsepower four-cylinder engine," Globe Drive said. "Perhaps that's partly because it's connected to the best-performing continuously variable transmission I have experienced; the combination is never thrashy, just velvety and quiet." Starting at $23,990 new, the base four-banger came with the manual or CVT, while the V-6 got the manual or automatic. The sedan (there's also a coupe) had four trims – LX, EX-L, Sport and Touring. There was also a hybrid version. A rear-view camera and automatic climate control were standard with the base LX. You had to move up to EX-L ($22,451, used) to get push-button start and safety tech, including lane departure warning. Edmunds gave the Accord an A – but it also gave that top grade to the Altima, Mazda 6 ("By far the most athletic car in the family sedan class"), Sonata and Fusion. It liked "the roomy and high-quality interior, refined and efficient powertrains, quick acceleration, responsive handling and generous standard features." It didn't like the "finicky" two-screen infotainment system or the lack of a split-folding rear seat. There were two recalls, including a loose connecting rod in just six vehicles.